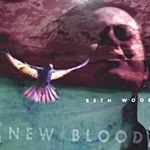 New Blood is Beth Wood’s darker, full band effort. Recorded in Atlanta with Kristian Bush (Sugarland) and Don McCollister producing. If you’re in the mood for something a little rockin’, a little jazzy, this one is for you. Beth has especially fond memories of the collaborative creative effort on this one, and she thinks it’s weird that she mentions birds in 5 of the 11 songs. Featuring Atlanta’s finest musicians and Angie Aparo on vocals.